In 2006, Brown University issued an extraordinary report detailing the university's relationship with the slave trade. The authors, drawn from Brown faculty, administration, and alumni, acknowledged the deep, intertwined history of the slave trade and the university -- and the role slave labor played in the very construction of the school. The report made headlines across the country, not least because it was commissioned by Brown president Ruth Simmons, the first African American and the first woman to become president of an Ivy League university. But Brown is hardly the only venerable university in the United States that is reckoning with its hidden legacy of slavery. Craig S. Wilder, professor of history at the Massachusetts Institute of Technology, demonstrates in his acclaimed new book Ebony & Ivy: Race, Slavery, and the Troubled History of America’s Universities, that practically every college and university founded during colonial-era America -- Harvard, William & Mary, Yale, Princeton, the University of Pennsylvania, Columbia, Brown, Rutgers, and Darthmouth -- has a history of slavery to confront. Professor Wilder recently spoke with me over the phone from his office in Cambridge about his book, the research behind it, and what America's oldest and most elite colleges can do to confront this painful history. Ebony and Ivy explores the intertwined relationship between the first colleges and universities in America and slavery. It argues that most older institutions of higher education in America were built on the back of slave labor. Were there particular universities that were relatively more invested in the slave economy? Yes, and I think part of the goal [of writing the book] for me was to explore, to find out, to discover, the role that slavery played in the founding and the rise of these institutions. To see that at Harvard in its earliest years, one of the residents of the campus was an enslaved man, or that the first eight presidents of Princeton – then the College of New Jersey – were slave owners, and enslaved people lived in the presidents' houses and served the presidents and students. To see the evolution of the Harvard/Yale/Princeton faculties, and the founding moment of Yale, when the founding trustees gathered to plan out the organization and wrote the bylaws of the new school – they were actually accompanied by their slaves to that meeting. So one of the things I found really interesting while researching the book was how intimate the relationship was between the academy and slavery in the colonial world, and how much these colonial institutions depended upon enslaved people, but also on the broader economy of the slave trade. You made the point in the book that many of the founders of these universities became quite wealthy as merchants profiting off of the slave trade. Yes, that's true. But you really have to look very closely at the denominational roots of the schools, and the denominational origins of the colonials. From the perspective of the twenty-first century, when you think about Columbia or the University of Pennsylvania, or Dartmouth, you think of them as wealthy, historic institutions. But these were pretty lean institutions in the eighteenth century, when they were founded. They were local institutions. The ministers and local activists founded these schools turned to local sources of wealth, and in the mid-Atlantic and New England, that meant they often turned to families who made their fortunes in the Atlantic trade, and a significant proportion of that trade was in African slaves. What were the missions of colonial governments and colleges and how did those missions intersect with slavery? The mission of the earliest colleges -- specifically Harvard, the College of William and Mary, and Yale – was actually to supply ministers, for two purposes: to supply religious leaders for the primarily British and to lesser extent European population in the colonies, but also to minister to the neighboring native nations. And as I alluded to earlier, one of the ways the founders of these schools paid for the the supplying of the faculty – and these faculties are really actually quite tiny – was to turn to local sources of wealth. At William and Mary, that meant the planters of Virginia, and the planters actually become the governors and trustees of this school. Harvard turned to local merchants in the seventeenth century, many of whom were West India suppliers who sent fish, for instance, south o the West Indies. As one economic historian put it, the cheapest quality fish was what was sent down to feed the enslaved population of the West Indies. 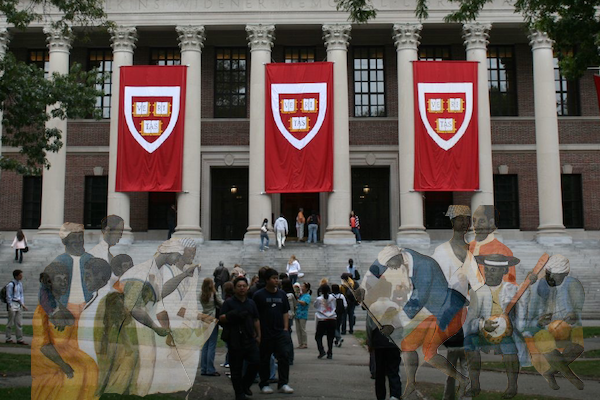 Not only did Harvard's New England backers have close ties to West Indian slavery, the school also followed these commercial networks south to seek out wealthy West Indian donors. And not only donors – also students. One of the ways in which these schools maintained themselves was by recruiting a supply of students who had money who could afford tuition who were in search of education, and so beginning really in the seventeenth century with Harvard, and continuing through the founding of the mid-eighteenth century colleges (which were all of the colleges from Princeton to Dartmouth), looking for students and recruiting students in the West Indies becomes a fairly ordinary business. To get back to your question about the denominational origins, here this is where the colleges were actually doing the local work they were founded to do. Baptists in Rhode Island established the College of Rhode Island (now Brown University) in order to supply an orthodox and well-trained ministry for themselves. That means that you have these very odd moments, one of which didn't end up in the book but which I'm writing about separately. I found it oddly ironic that before the British even evacuated North America after the Revolution, before they even finished evacuating New York, the president of the College of Rhode Island James Manning sat down at his desk and began sending letters off to England to wealthy Baptist friends. One of the things he's asking for is to put the small matter of the past conflict -- which has just ended -- behind them, and remember that they're Baptists. The future of the communion rested upon their close ties. These are actually fundraising letters. Manning offered to rename the school after wealthy Baptist British donors, and asked for help in locating such a person. The school was ruined by the war – it'd been occupied by both armies for a time – and there was a lot of rebuilding to be done. But what I find striking about that moment is that even at the end of the American Revolution, after seven or eight years of conflict and bloodshed, the denominational ties between these schools and England remained intact enough that many college presidents thought they could continue to use them as a source of funds and students. Now, going back to something we touched on a little bit earlier, the use of slave labor to actually build these universities and operate them. I realize it's very difficult to actually find slave narratives and stories, but were you able to piece together any stories from any of these campuses about the slave laborers who lived there? Well, you don't evidence of it on every campus, but you do find evidence of it on enough campuses and in enough archives to realize it was fairly common to use slave labor. For instance at Brown, when the original trustees were raising donations for the school, local residents of Providence and Newport donated cash, lumber, and other goods, and they donated the labor of their slaves. You can actually see people donated the labor of their enslaved person for a certain period of time. At the College of William and Mary, teams of slaves were used for the upkeep of various buildings, and the College actually held a fairly sizable population of slaves for use as campus servants, dedicated at times to specific buildings. Some of the students at William and Mary brought slaves to campus with them. Eleazar Wheelock, the founder of Dartmouth, arrived in New Hampshire in 1770. He brought with him eight enslaved black people, and he wrote in his narrative [memoir] about the early struggle to build the college (he later used the narrative as a fundraising tool). He wrote about the use of his slaves to help lay out the fields and raise some of the original structures of the college to get things going. He actually has several places in his narrative about the things he'd assigned his laborers to do to improve the campus and expand his ability to take in students. How long have you been researching this topic? Eleven years from the beginning to the publication of the book. It started back in 2002, when I had just gotten tenure at Williams and I'd moved to Dartmouth that fall. I had just finished my second book project when I'd gotten there, and I decided to do something small, and I wanted to write a history of black abolitionists in New York – probably just an article. I wanted to explain how these free black people who opposed slavery in the decades before the Civil War managed to become professionals when they were in fact excluded from colleges and universities -- how do you professionalize in a world where you lack access to higher education? Part of the reason I wanted to write that article is because in many ways it's a very New England story, because a lot of them from the mid-Atlantic came up to New England to study privately. But what ended up happening is that I became much more interested in the fact – in part because I was at Dartmouth and Dartmouth has an extraordinary Native American studies program -- that Dartmouth had Native American students on its campus for two hundred years before the 1830s and 1840s. So the barrier wasn't just race. There was clearly something much more interesting happening. And that needed an explanation. It suggested that colleges had a role in the colonial world that I really hadn't thought about. So I dropped that original project, and I just started looking earlier and earlier into the histories of these schools and the way that they functioned in the individual colonies. Why native students had been brought to campus and under what circumstances. The oddness of looking at campuses as a site where Native Americans, European Christians, and Africans co-existed but in very different capacities and in very different ways. I was intrigued with the college as a site for exploring and reinterpreting early American history and saying something new about early American history. What about the 2006 report of the Brown University Steering Committee on Slavery and Justice, which investigated Brown's relationship with the slave trade? Where the Brown report became important for me is that four years later I realized this was a huge topic. I was nowhere near the point where I could outline the structure of a book, but I had done four years of research, and I felt like I had four years of very interesting -- but not necessarily connected material -- and I was ready to stop. I thought that maybe I should just publish a few articles on these various things that were interesting in different journals and forget about some larger project. But when the Brown report came out I was just honestly sort of taken by both the boldness of the report, the courage of President Ruth Simmons who commissioned the report, and in taking up this task, particularly being the first person of color and the first woman to head an Ivy League school, I just thought the extraordinary courage it took to take that step, and to commission the report, and her articulation of the obligation to pursue those truths and pursue that history to the students, faculty, and alumni at Brown and the broader community, I just found it so compelling that I felt obliged to continue. I didn't know it was going to be another seven years before I was done... that's the story of how I got here. It was not a project I had set out to do. I just kind of wandered in this direction as I became more and more intrigued by this possibility of rethinking early American history by reexamining the role of the college in the colonial world. Do you feel in the aftermath of the Brown report – and quite possibly in the aftermath of the publication of your own book -- there will be a reassessment at these various colleges and universities of institutional memory? Yes, I think so, but I think the Brown report did that. And I think what has happened since then has really been striking. If you think about what's been happening at Emory, Alabama, North Carolina, and Harvard, faculty, students, librarians, alumni, and now even the presidents of these institutions – and even the trustees -- are increasingly taking steps to recognize this history, to acknowledge it, and to address it in institutionally specific ways. I think in many ways that's a measure of just how powerful the Brown report was. The impact it's had on the broader galaxy of elite academic institutions. Not all have done it, but a lot of them have. And I think that's only going to move forward. One of the great lessons of the Brown report, and of Brown's experiences in history, is that seven years later, Brown is stronger because of the decisions made between 2003 and 2006, when President Simmons commissioned the report and when the report was released. It's a stronger community, and it's taken a leadership position in a very difficult public engagement with history that's painful, but that we have a need to address, and that we ultimately cannot escape.